To open the Board 8 options window, click the Board button then select the Board options icon. The Board options allows setting user preferences. Ask exit confirmation. Asks confirmation when closing Board. Ask title and database on screen creation. Automatically prompts database name and screen title when creating a screen. Use graphical data selection. Shows entities and relationships in a hierarchical tree. Show entity groups. Displays entities in groups. Show SAP tab. Displays the SAP Datareaders protocols in the Data Reader window. Clear recent documents. Clears the list of recently opened capsules. Reset quick access toolbar. 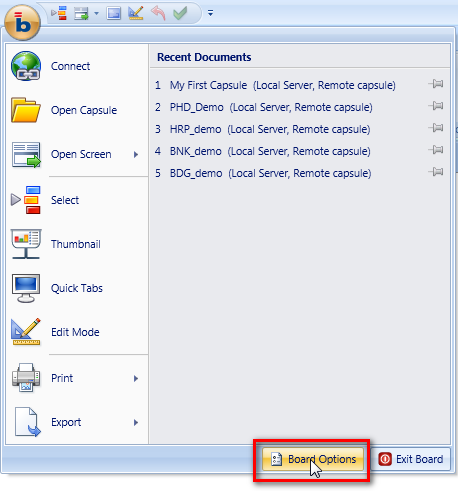 Resets to the default configuration the quick access toolbar. Allows to choose a predefined color style for the Board Client: Black, Blue, Silver or Aero. Saved Capsule Passwords. Allows to view or delete the currently saved passwords for opening Capsules. Note that it is possible to password-protect the opening of a Capsule, it is possible however to save such passwords to avoid having to retype them at every access. When saved, passwords are encrypted and stored in a file under the user's Windows profile. Open SQL Log. Displays the history of SQL commands that the user has executed during the current session. This log is not saved to a file. Board User Interface. 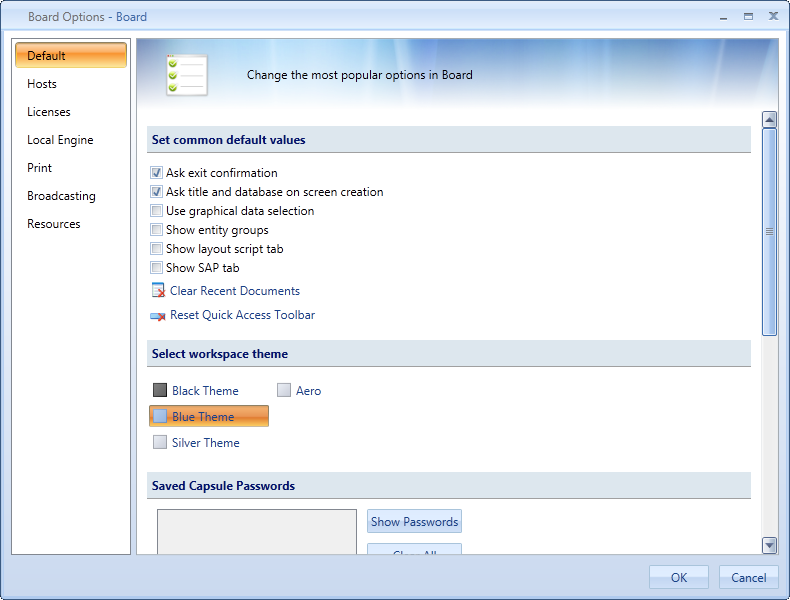 Allows to choose the language of the Board Client user's interface. Currently the available languages are English, Italian, German, Spanish and Chinese. You need to restart Board Client before the new language will take effect. This window allows to configure the connection parameters to the Board Servers available. Default. Sets the default connection, when enabled the Board client will automatically connect at start-up. Title. Name of the connection, this is a short name that can be chosen as desired. Host. IP address or host name of the Board server. Base Port. TCP/IP port of the Board server service. The default value is 9700. Secure. Enable to encrypt communications. SSL. Enable if when Board server uses a certificate and SSL. Select stand-alone licence file. Select your Board Client license file in case you have a license of type Stand Alone. Key Manager. Runs the Keymanager program which allows to create a request for a Board license as described in License activation process. Local Engine license file. Select the Board license file to enable your Board Client to use databases stored locally on your the hard disk. choose here a license of type Master. You need to restart Board before the new licence settings will take effect. These settings should be defined only if you will be working locally, connected to LocalEngine. When the BoardClient is connected to a Board Server, these settings are not relevant and can be ignored. Board Path. Location of the Board directory which contains databases and capsules. Report Rows Upper Limit. Sets the maximum number of rows for a report. The purpose of this threshold is to avoid executing very large reports (runaway queries). Preloaded Databases. Allows to set which databases should be loaded the start-up of the Board Client, loading InfoCubes in RAM thus reducing the time required for the first access. Note however that pre-loading databases will increase the time required to start the Board Client. Disable RAM Cubes. Disables all RAM InfoCubes for all databases. This allows to reduce the amount of memory required to open the database in case the database contains some InfoCubes in RAM. Print Settings. Sets the default printer to use for printing. Note that the user can change the default selection as described in Printing from the Board Client. Restore Defaults. Restores the default settings. The following configuration parameters are necessary for the e-mail Broadcasting action which allows a user to e-mail Board reports to a list of recipients. Mail Host Address. define the name or address of the SMTP server to use for sending e-mails. Port. Specifies the TCP/IP port number used by the SMTP server. Mail From. Sets the address of the sender. User Name and Password (Optional). If your SMTP server requires authentication, type the credentials. Contact us. Opens the web page http://www.board.com/business-intelligence/wwl where you can find information on how to contact Board. About Board 8. Opens the about window of Board Client, where you can find the exact version and release number of your program.